Not only are the versatile Black & Decker PSL12 cordless outdoor pruning saw perfect for pruning branches and removing shrubs and bushes, but also can be used to cut plywood, 2x lumber, metal and PVC (when using “T” shank blades). Its specialized 6-inch pruning blade is able to cut branches up to 3-inch in diameter. And it comes with an exclusive clamping jaw to secure branches, ensuring a clean cut without too much vibration. In addition, its lightweight design and compact size make it possible to reach into tight spaces where other saws can’t. 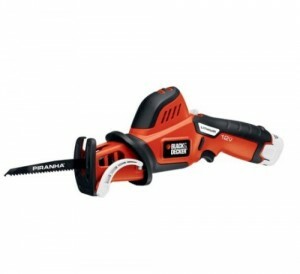 The Black & Decker PSL12 is powered by a 12-volt Max lithium-ion battery to deliver a longer lifespan. It can cut over 50 1-inch oak branches per charge. In addition, the battery also has a lightweight design. The result is that the unit weighs just 2.5 pounds with battery installed. The external battery charger is Energy Star-qualified, which means you will waste less money on your electrical bill. The Black & Decker PSL12 cordless outdoor pruning saw comes backed by a two-year limited warranty.